Going to Dandana is like shopping at a Middle Eastern bazaar—you get a little bit of this, a little bit of that and a great deal of culture, flavor and energy. Note friends, Dandana takes you on a magic carpet ride far, far away from Queens and into lands of Egypt, Morocco and Lebanon. Dandana’s is the only Middle Eastern eatery on the block, setting itself apart from Astoria’s Little Arabia neighborhood. Walking into this joint, you immediately notice various hanging lanterns, cushiony seats with tassel pillows and eclectic Middle Eastern music. It’s a lot of fun to come to Dandana on a Friday night when you'll enjoy the boisterous atmosphere while smoking hookah and admiring the curvaceous belly dancers. The appetizers at Dandana are the best thing on the menu. Click here for menu. I highly recommend getting the hummus, which comes in a big round bowl, seasoned with extra olive oil, paprika and other spices. The falafel is also exceptional--it's amazingly crispy on the outside and soft on the inside. I would opt-out for the sandwiches here. While they’re not bad, they’re plain and could be ordered anywhere else. Instead, I’d get a slow-cooked Tagine—a Moroccan specialty. The hookah is a big reason why I come here. 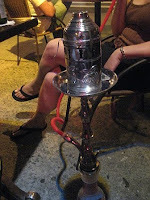 The actual hookahs are very large and attractive- looking with ornate pipes. My favorite flavor is the mixed fruit and I get it every time. I’d urge you to stay away from the apple hookah which doesn’t actually taste like apple at all. The service at Dandana depends on the server and the time of day. While some waitresses are quick and conscientious, others can be standoffish and downright rude. The prices are moderate to inexpensive; $4 for appetizers, $5.50 - $8.00 for soups and sandwiches and $11.00 -$18.00 for main dishes. We have been going there for the past month almost twice a week and also reccomending it to all of our friends. 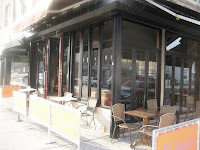 Although we love the feel of the place and the concept, we will NEVER be going back because of the awful experience we had last time we were there.The terrible service does incredible injustice to the owner's good taste and great business plan. We waited 15 minutes for someone to come to us with menus with an empty restaurant at 8PM on a Tuesday (there were ONE other table -friends of the waitress).My husband ordered a Hookah and the rest of us ordered food.We waited for about 10 minutes and figured out that the waitress forgot about our hookah so he got up and went to the table where the waitress was smoking her hookah and drinking with her friends and tapped her on the shoulder. She admitted she forgot. After we ate (food was great as always)I saw the wairess' table smoking cigarettes and I asked her if I can also light one up so I did not have to go outside.She said no.I then asked why that table was allowed to smoke and we weren't and she said " well, they come in a lot..." EXCUSE ME?!?!? We decided to go and asked for the bill. The mango juice we never got was on there and the tea that was anounced $3 on the menu, was charged almost double on the bill (it was $5).I asked her for a menu,showed her the price difference and asked her to change it to what the menu listed. She didn't care, she said "the prices change". "Why did you not tell me before I ordered the tea, I would have gotten something else, $5 for a tea is a little exaggerate - not event 3 star restaurants in the City charge that? " Anyway, my issue is not with the way they price things -everyone in entitled to charge as much as they want. My issue is with the fact that I feel that they tried to scam me with showing a different price on the menu. I will let all of my friends to not go there anymore and I will post this online anywhere I can so that everyone will know what kind of business you run. I guess you are doing so well that you can do without the hunderds of dollars we were dropping there every week!!! Good luck - you'll need it! Wow, that's pretty crazy. I know what you mean about inattentiveness though. Some of the waitresses are totally clueless and I've experienced that myself. It's hit or miss though--sometimes they're on and sometimes I don't know if they're on this planet. I'd try it once more if I were you, but if you're totally fed up, I get that too. I hear ya - bad service can ruin everything. I have yet to go to Melody but will have to try it soon. 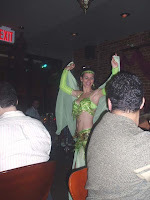 I like it too - especially when they have a belly dancer. Last time though, we waited so long for the belly dancer to show up and she never did :( Disappointing.